We told the kids this morning, Michael was trying to pick up meds and if he was successful, we were going to hit the road. Stacia's first question was, "Are we taking the trailer this time?" Driving is slower and a bit more stressful when we drag the Caboose - but it is WAY nicer on the packing, unpacking and sleeping side of things. 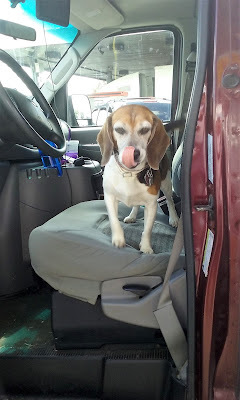 She was relieved our home was coming with us this time. 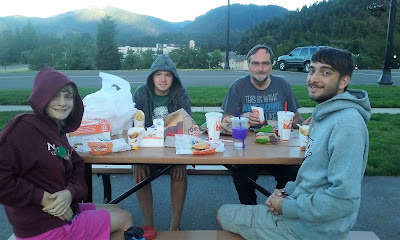 Our plan was to stop at a Truck stop outside of Medford, OR. We kept on driving. We drove until the gas light came on, and then we coasted 7 miles into Seven Feathers to get some gas. Michael estimates we had about 1/2 a gal left when he filled up. Our next thought was we'd get dinner and stay at the Seven Feathers Truck Stop....but up the road from the Truck Stop we noted Jordan Creek REST AREA - not an overflow parking lot - a REST AREA. The view is pretty. It's FREE. Look for exit 99. It's up above the Truck stop and I-5, the parking spots are wide - we put up our slide and still had plenty of room. It's well-maintained and quite pretty. SCORE for boondocking. We've slept in driveways, we've slept in the van in truck stops, state parks, military fam camps, RV resorts, and RV parks, but this is our very first time to boondock in the Caboose. SCORE. We are well aware this is more like urban boondocking - but it is dry camping and free. Yay for boondocking. It looks like a very nice place. So fun following your adventures. so neat the records you keep. will help you get the many stories to tell the GKids some day started etc.